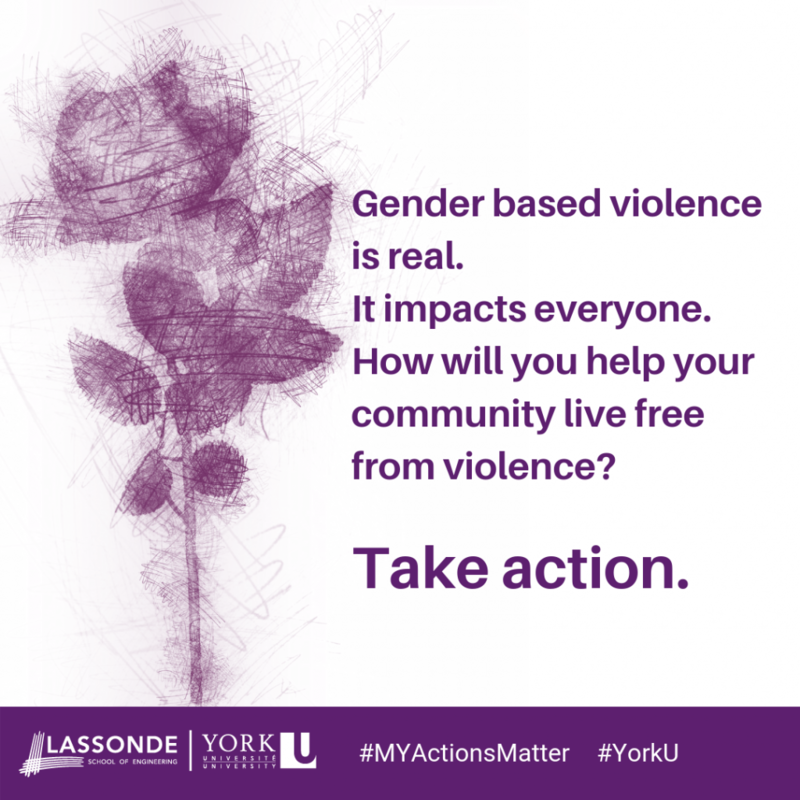 TORONTO, November 30, 2018 – York University’s Lassonde School of Engineering will host a ceremony to recognize the National Day of Remembrance and Action on Violence Against Women on Monday, December 3 at 11:30am. The ceremony commemorates the lives of 14 young women who were murdered at l'École Polytechnique de Montréal in 1989 in an act of gender-based violence. This year will mark the 29th anniversary of the tragic events in Montreal. This day provides an opportunity for Canadians to reflect on the pervasive issue of violence against women, Indigenous, racialized, LGBTQ2+, people with disabilities and others who are marginalized in society. The pan-University ceremony is a collaborative initiative between President and Vice-Chancellor Rhonda L. Lenton, the Office of the Vice-Provost Students, the Centre for Human Rights, Equity and Inclusion, the Centre for Sexual Violence Response, Support & Education, the Community Safety Department, W.I.S.E. Lassonde, Lassonde Engineering Society, Lassonde Student Government, York Federation of Students, and the School of the Arts, Media, Performance & Design. The ceremony provides an opportunity for York’s student, faculty and staff to consider how we will help our community live free from violence. Who: Hosted by President and Vice-Chancellor Rhonda L. Lenton, VP Students, Lucy Fromowitz, the Lassonde School of Engineering, the Centre for Human Rights, Equity and Inclusion, the Centre for Sexual Violence Response, Support & Education, and the Community Safety Department. Jane Goodyer, Dean, Lassonde School of Engineering joined York University from Massey University in New Zealand this year. She is an advocate of the advancement of women in engineering. In her previous role in New Zealand she launched a national engineering outreach program for girls aged 10-14 in order to encourage girls to consider a career in engineering. She holds a BEng in production engineering from Coventry Polytechnic and a PhD in manufacturing systems design engineering from Coventry University. Goodyer then held an appointment at Coventry University, where her research included working with automotive businesses in applying advanced joining technologies for body-in-white manufacture. Her research interests have since evolved from a focus on manufacturing engineering to a concentration in influencing change in engineering education. Emily Secnik is a third year Civil Engineering student and President of Lassonde Engineering Society. She is also the recent winner of one of the Canadian Engineering Memorial Foundation scholarships founded after the December 6th Massacre. Secnik is passionate about promoting women in STEM and ending gender-based violence in her community. In her first year, she co-organized a National Engineering Month event in the Rexdale community to promote STEM to grade 6-8 students. She also is a proud supporter of the Lassonde 50:50 Challenge and is a 50:50 Ambassador.